Join the thousands of gardeners, bee enthusiasts and school students across Australia who are setting up Bee Hotels (aka Bee Motels) to help their local native bees! 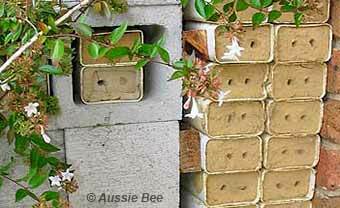 Aussie Bee first started designing Bee Hotels in 1998 [download an article we wrote about this in 1998 in Aussie Bee Bulletin]. In this Aussie Bee guide, we present the techniques that we have learned over the years for making Bee Hotels, as well as recent advice from other Australian bee specialists. 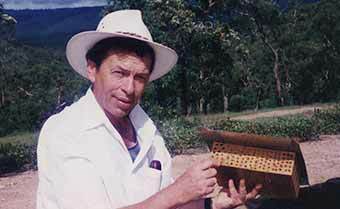 This is Les Dollin of Aussie Bee in 1998, with his original design for a resin bee nest block. PART 1. What is a Bee Hotel and how can it help? PART 2. How do I make a Bee Hotel? PART 3. What bees will use my Bee Hotel? PART 4. What other insects will use my Bee Hotel? PART 5. What should I do about pests and parasites? 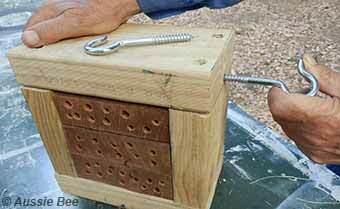 How to make a timber Bee Hotel for Resin Bees.